In addition to fear, I think our own best intentions often hold us back in education. 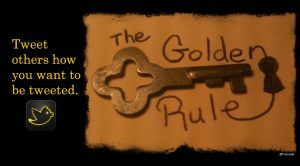 The Golden Rule, treat others as you would have them treat you, seems like a worthy way to go through life, but I believe it can actually be detrimental to many. My husband and I will celebrate our twenty-first wedding anniversary later this month. That suggests we’re doing something right. However, I’ve come to realize that when I want to do something kind for him or be extra helpful, I fail thanks to the Golden Rule. He is a college professor so the beginning and end of semesters are often extra chaotic and times in which I’d like to do what I can to take things off his plate. That often means I’ll make sure the dishes are all done and the kitchen is cleaned up. But honestly, I don’t know that he really notices that. I’m the one who feels stressed when there are dirty dishes piled up in the sink. If I want to really help him, it would probably be better if I dealt with all the old leftovers in the refrigerator or emptied the overflowing recycling bin. Those things don’t bother me so much so I don’t think about them but they would likely be more helpful in lowering his stress levels. I have the best of intentions but I am doing what I want rather than what might truly help him. My older daughter, the one who deals with anxiety, school doesn’t work as easily or as well for her. It requires more effort. For my students? Many of them speak other languages, many are first and second generation immigrants, many face food and housing insecurity, many have faced numerous traumas in their lives. School doesn’t always work as well for them and that’s a systemic problem we need to face.